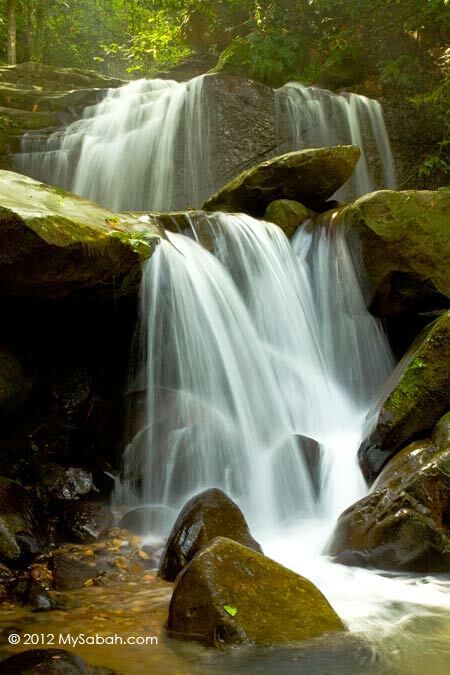 The mountainous terrain of Sabah makes us the land of waterfalls. 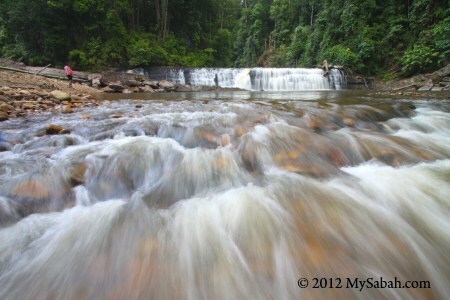 There are thousands of waterfalls in Sabah forest, most are waiting for explorers to name them. Looking at waterfall can calm our minds better than watching the whirling movement in washing machine. 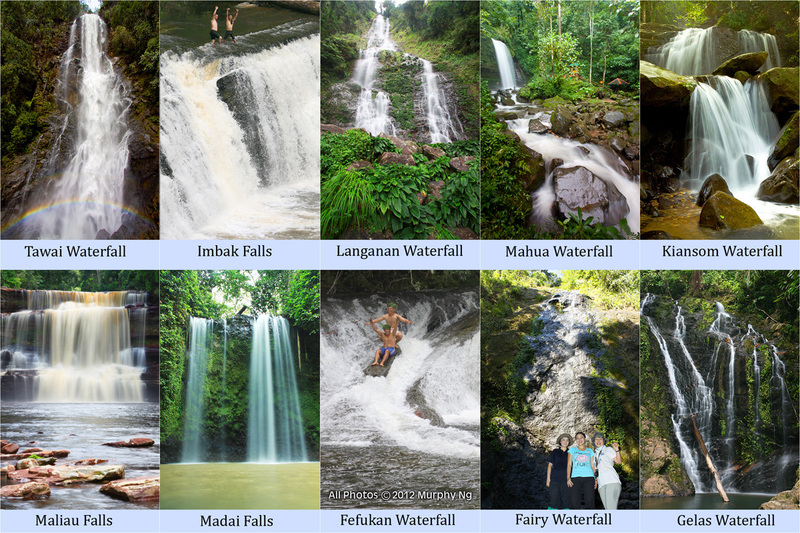 So I compile a list of Sabah’s Top 10 Waterfalls for those who want to enjoy heavy doses of negative ions. 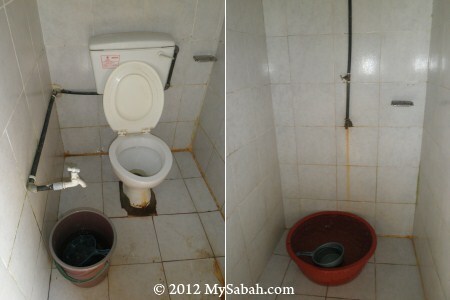 Pic: the location of Top 10 Sabah waterfalls. Besides Scale, this waterfall ranking is also based on Popularity, Accessibility and Travel Experience. That’s why some giant waterfalls are not listed. 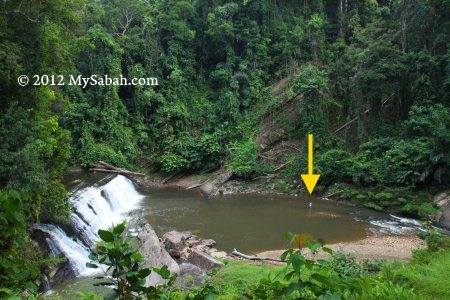 For example, though Kadamaian Waterfall is the highest waterfall of Sabah, it is too difficult to get there. Please note that most height measurement is by estimation. Yes, I know, Kiansom is the smallest waterfall in the top 10 list. 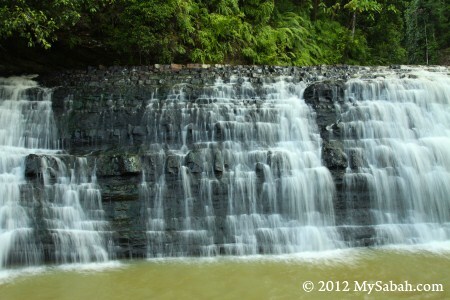 It is listed because it is the most famous, accessible and visited waterfall in Kota Kinabalu city. I can’t exclude the waterfall that everyone loves. 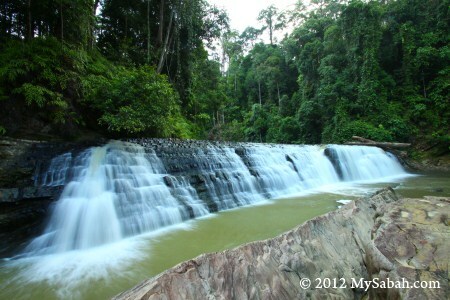 Gelas Waterfall is situated in Tawau Hills Park, a lush rainforest zone and source of five rivers. 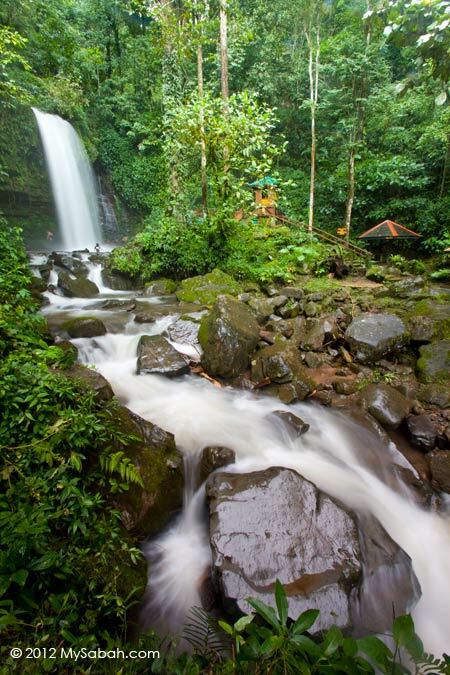 Hiking to Gelas Waterfall is a pleasure to nature lovers, as they can visit the tallest tropical tree in the world and soak in sulphurous hot springs in the park. 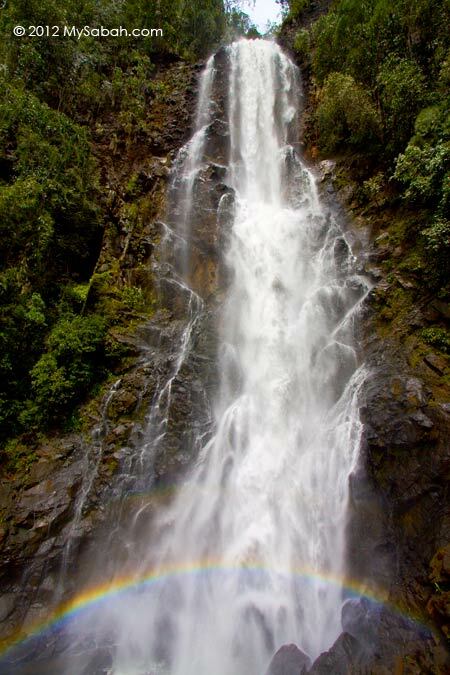 Tawai Waterfall is the least-known waterfall, but its view is so spectacular that it will blow you away. 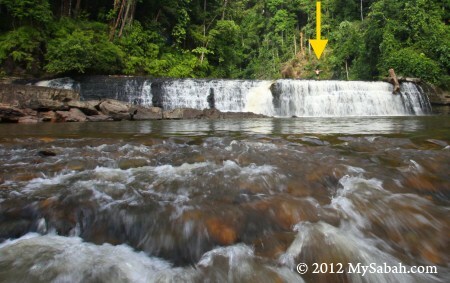 The area around this waterfall is full of Borneo pitcher plant. Denmark’s biggest television network, Tv2, has chosen this waterfall for filming of “Girls Off The Beaten Track”. 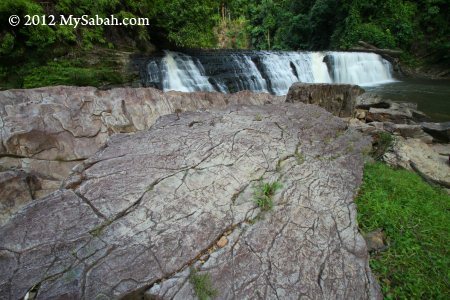 Madai Falls is probably the first Sabah waterfall visited by human, maybe a caveman about 28,000 years ago. I’m not joking. Archaeologists say Madai-Baturong has the oldest human settlement of Sabah. I believe stone-age people love waterfalls as much as we do. This shy Fairy Waterfall is hiding deep inside the 130-million Borneo rainforest of Danum Valley. The photo here may not look impressive because it was taken during prolonged drought. 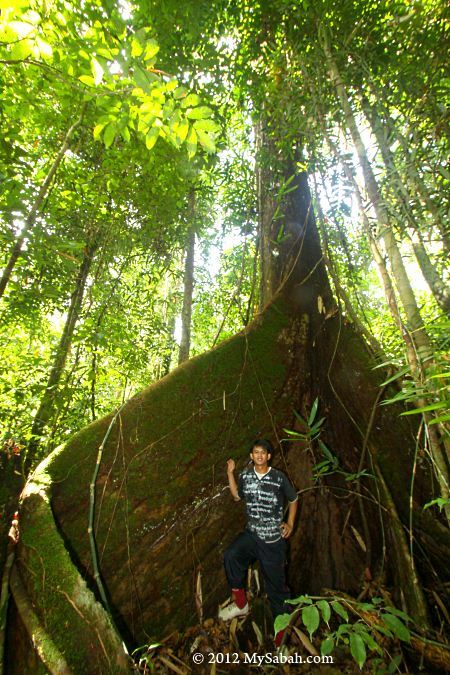 Danum Valley will be nominated as the next UNESCO World Heritage Site of Sabah/Borneo. To see Fefukan, Travellers need to hike a long way to the Heart of Borneo, making it the most remote and least visited waterfall in my list. Camping next to this waterfall is one of my most unforgettable experience. Lucky visitors would see blooming rafflesia around there. 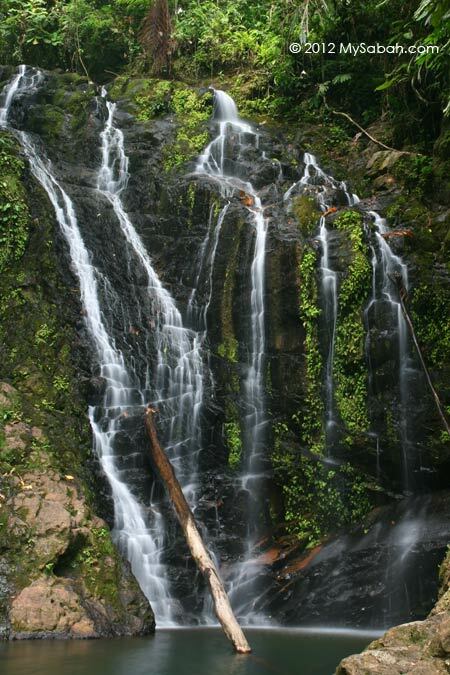 As part of the Crocker Range Park, Mahua Waterfall is protected as a water catchment area. 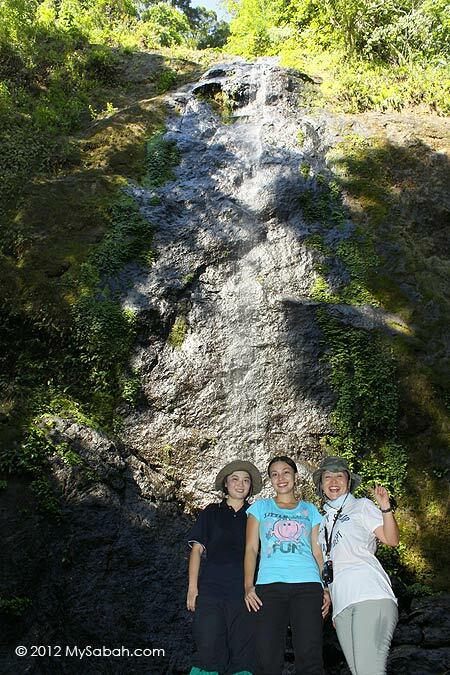 Hence, visitors can enjoy cooling and refreshing water from clean mountain stream. On the way to Mahua Waterfall, you may drop by Tambunan Rafflesia Center to check if you are lucky enough to see a blooming rafflesia. 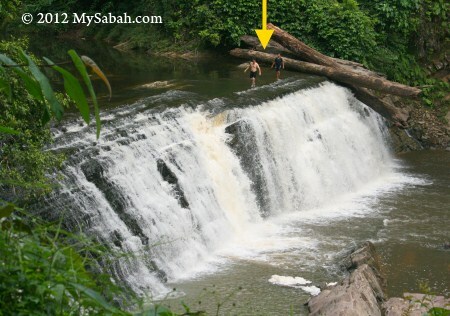 Even though Imbak Falls is only 6 Meters (20 feet) high, it is the widest waterfall of Sabah. I just love sitting in the river, as the strong current turns its waterfall pond into a Jacuzzi bath area. Located in Poring Hot Springs, the most popular destination of Sabah and 1st UNESCO World Heritage Site of Malaysia, the majestic view of 120-Meter-tall Langanan Waterfall is only saved for those visitors who are keen to hike nearly 4 Kilometers (2.3 Miles). It is more enjoyable to soak yourself in the hot spring after a long walk in the jungle. Here you go. 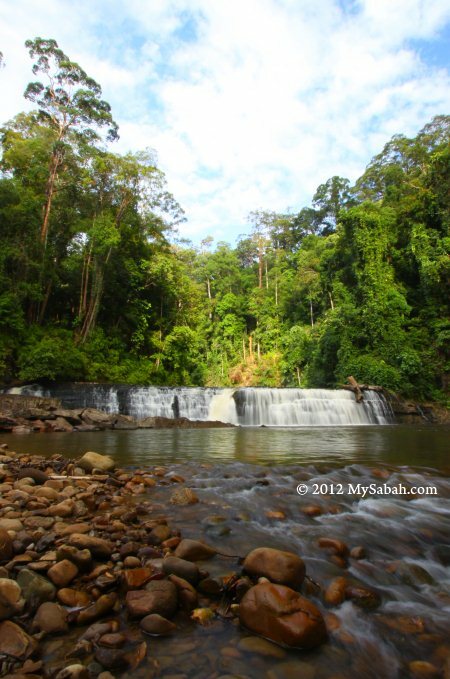 The No.1 Waterfall of Sabah is the 7-tier Maliau Falls in Maliau Basin, Sabah’s Lost World. 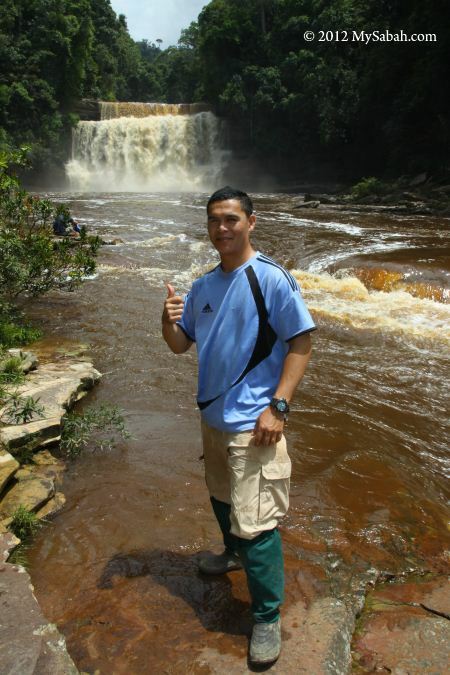 To see Maliau Falls, you need to trek 2 days on the treacherous relief and pass through miles and miles of dense pristine rainforest. With over 30 waterfalls (and counting), Maliau Basin is also known as the Capital of Waterfalls, and Maliau Falls is the most breath-taking among them. Another feature of this waterfall is its tea-color water, which is caused by plant tannin released from heath forest upstream. The magnificent Maliau Falls will leave a beautiful memory in you, a scene that you like to replay in mind from time to time. Which Waterfall is your Favorite? Do you agree with the Top 10 Waterfalls list? Please vote for your favorite waterfall below. I would love to see if everyone shares the same view. You can even add new waterfall if your favorite is not in the list. 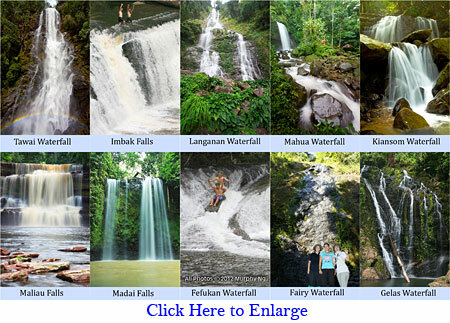 Below is a montage of Top 10 Sabah Waterfalls (Click it for bigger picture). You may share it in your Facebook. Thanks to readers who link to me. Don’t swim near to the waterfall. The waterfall pond can be deep, with unseen swift currents underneath. Don’t climb to the top of waterfall, as the rocks there are usually slippery. Don’t stand under the waterfall. Even a small stone fallen high from top can cause severe injury. During wet season, watch out for flash flood. Flash flood can occur even if there is no rain downstream. Teachers, if you plan to bring a group of pupils to swim at waterfall, equip yourself with lifebuoy, rope and CPR knowledge. 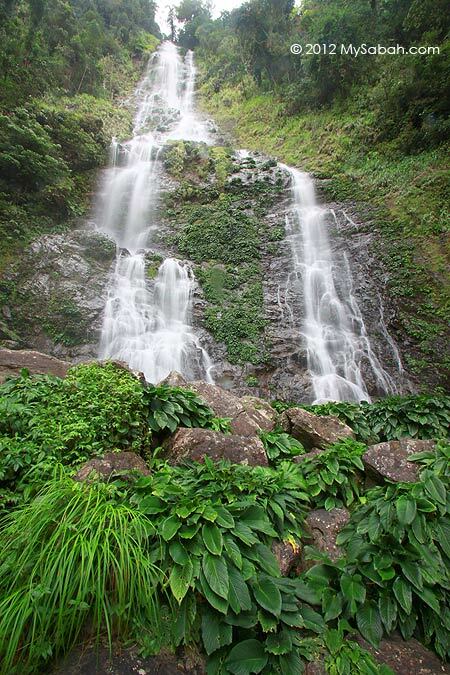 If you know any nice waterfall around your hometown, please share with us by posting the photo in comment box below. 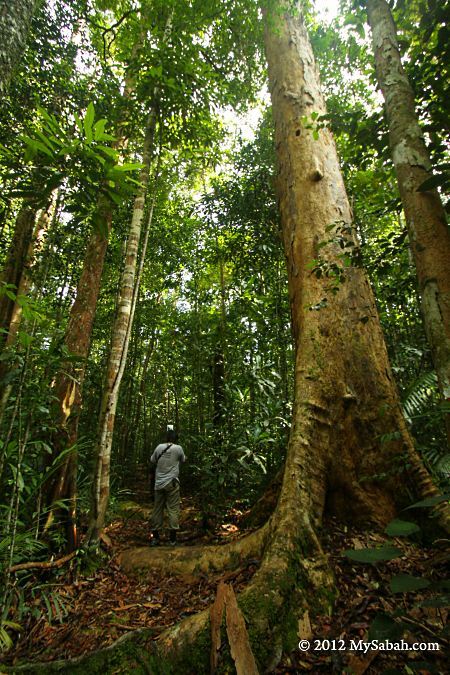 Most tourists and researchers, who have visited Danum Valley or Maliau Basin, agree that Sabah has the best Borneo rainforests. Both forest reserves are so pristine that they would become our next UNESCO World Heritage Sites. 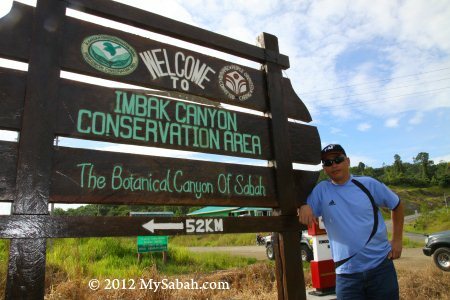 You will be happy to know that Imbak Canyon, a Class-1 30,000-Ha Forest Reserve in the Heart of Sabah, is as high quality as them. As seen in the map above, Imbak Canyon is a 3-KM-wide valley about 150 Meters above sea level (asl), flanked by ridges running parallel 25 KM from west to east, which are mainly sandstone cliffs with a height up to 1,500 Meters asl. This impressive landscape is formed by 750 Meters carving of the Sungai Imbak (Imbak River) over thousands of years. Though Imbak Canyon is not as majestic as Grand Canyon, it has dense forest that is over 100 million years old. It is a “Green Canyon”! 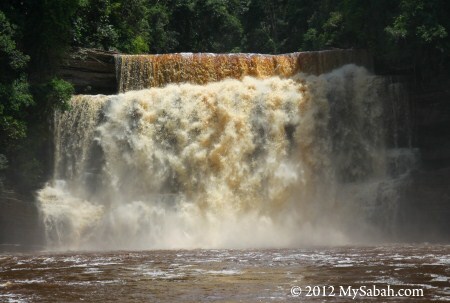 Pic: Imbak Canyon is just at the north of Maliau Basin. 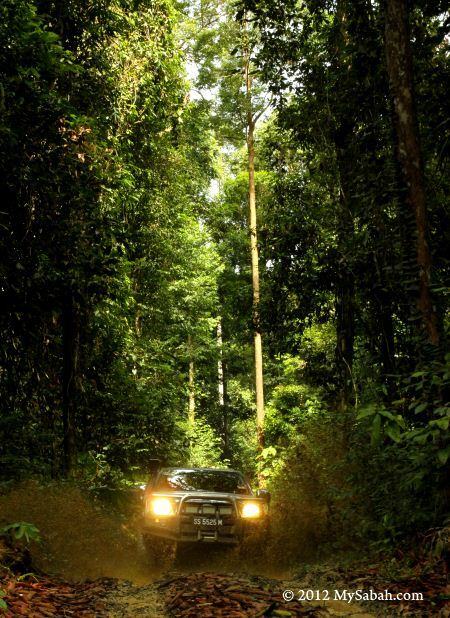 However, to get there, you need to drive nearly 300 KM for more than 6 hours from Kota Kinabalu (KK) to this remote forest. The 3.5-hour drive from KK to Telupid town is on paved road, the rest on gravel & muddy road, which can be steep and muddy. Probably that’s why it isn’t a popular destination for ordinary tourists. 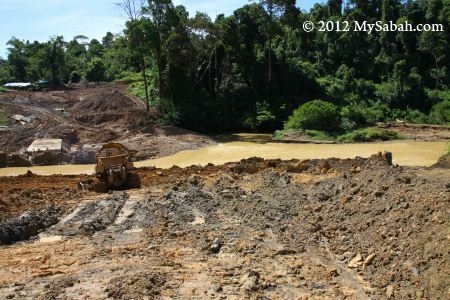 Pic: the junction to Imbak Canyon at Tongod. This marks the start of our 3-hour bumpy ride. Though Imbak Canyon is only accessible by 4-Wheel Drive (4WD), some loves this and call this an adventure. Trust me, this is the most “violent” ride that I ever followed. The feeling is like sitting on the wild horse that tries to throw you out of its back. Thrilling though. 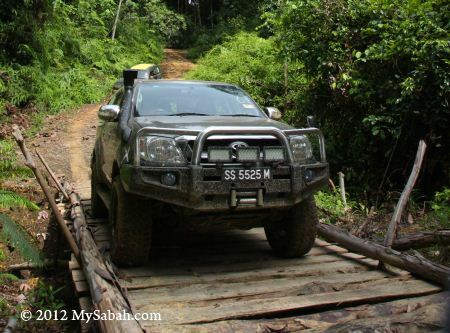 The 4WD needs to be equipped with snorkel (to cross river), locker and jungle trekker tyres (with costs RM1,000 each). Besides, you need a skillful 4WD driver, not those middle-aged uncles who drive 4WD in city street. We are glad to have Gilbert, a North Borneo Safari driver to come with us. 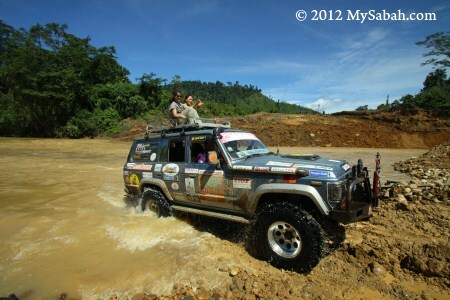 His 4WD is unstoppable and he also helped to pull out a few 4WDs stranded in mud during the course. 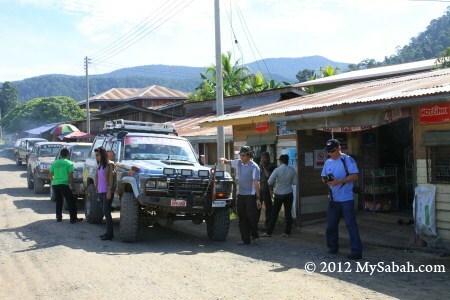 We stopped by Kampung Imbak (Imbak Village) in Tongod for a short break and buying supplies. 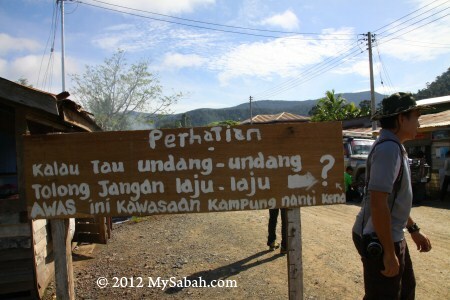 This village is the last civilization on the way to Imbak Canyon. Pic: funny signage that translated as “Attention. Please don’t drive too fast if you know the law. Be careful, this is village area, or else.” Probably the villagers are unhappy of the dust created by passing vehicles. 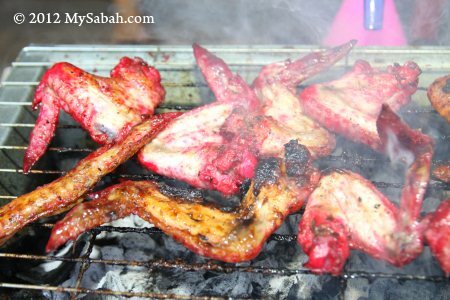 Pic: red BBQ chicken wing of Kg. Imbak. They apply coloring that looks like roasted pork (叉烧). 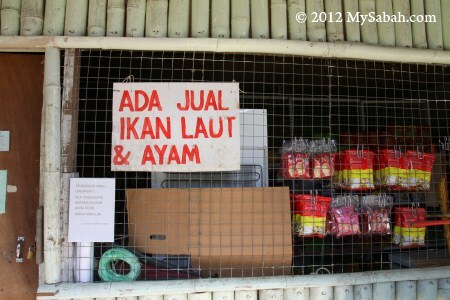 Pic: grocery shop that sells chicken meat and seafood. We continued our journey after shopping. 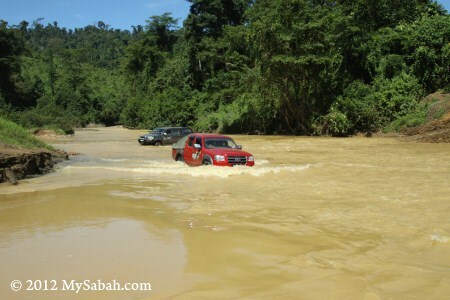 About 13 KM before Imbak Canyon, we need to cross a wide river, which is the biggest obstacle. There is a bridge under construction. Once the bridge is complete in future, Imbak Canyon will be more ready for tourism. The bridge is completed and can be used now. However, some may still prefer to cross the river for fun. Luckily the river is not deep so our 4WDs can cross it without problem. Our trip was cancelled once, because this river was flooded during rainy season. Before the bridge is complete, if it rained, we would needed to wait 3 to 4 hours for the flood to subside before crossing. 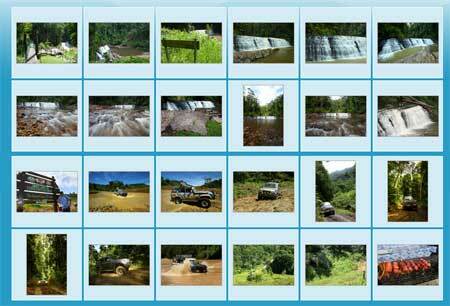 In worst case, the water level can reach the window of 4WD. The bumpy ride can freak out faint-hearted passengers. The trick is not to sit stiff and counter the momentum. Just relax your body and let your weight “stick” you to your seat like soft mud. You will find that your fat is so useful in this case. 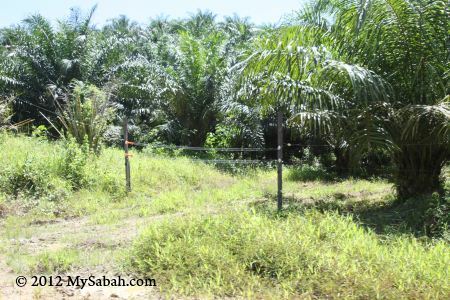 We passed by oil palm plantation and saw some electric fences that prevent pygmy elephants from entering. Finally, we arrive Tampoi Base Camp (or Tampoi Research Station) of Imbak Canyon at 12:30pm. Tampoi is the name of a Borneo fruit. 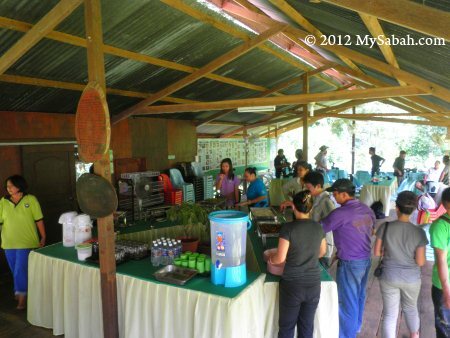 We check-in at Tampoi Camp and have our lunch there. 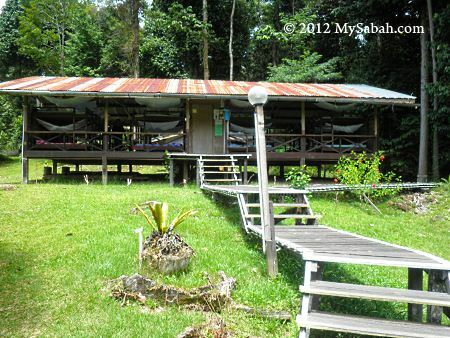 The forest and campsites of Imbak Canyon are managed by Yayasan Sabah Foundation. After feeding our stomach, we proceeded to the most famous attraction of Imbak Canyon – the Imbak Waterfall. Imbak Waterfall is only 10 KM away from Tampoi Camp, but it took us more than an hour to get there, due to the steep and slippery road. We were told that we would need to walk, if there was any landslide or fallen tree blocking the way. Pic: the entrance of Big Belian Camp (BBC Camp), where Imbak Waterfall is located. At the right is a wooden staircase to Imbak Waterfall. Our cars can park near the entrance, so it’s only a short walk to the waterfall, very convenient. 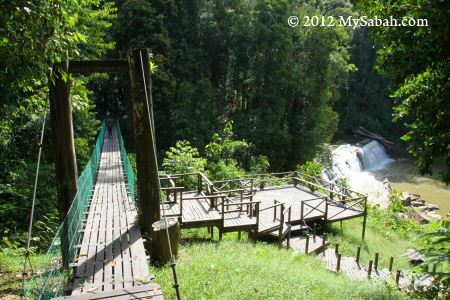 The Kangkawat suspension bridge at the left leads you to the jungle trail. Pic: the view of Imbak Waterfall from the viewing platform. Note the man is so small. Pic: the front view of Imbak Waterfall and Imbak River. The water is in light tea color but it is very clean. The color is caused by the tannins leaching out from the plant growing in Imbak Canyon. Imbak Waterfall is a must-see if you visit Imbak Canyon. 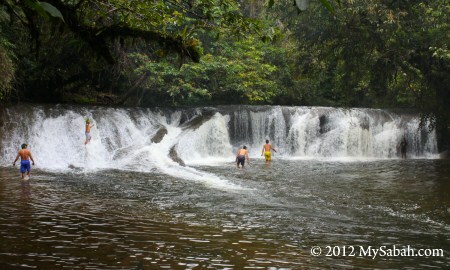 I would say it is one of the most beautiful waterfalls of Sabah. Imbak Canyon is an important water catchment area. 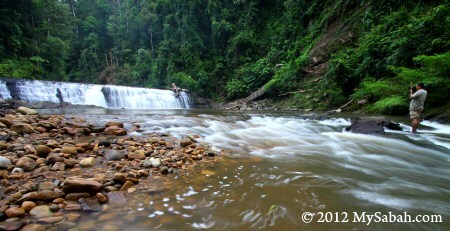 This Imbak River is one of the sources of Kinabatangan, the longest river of Sabah. More than 30 species of amphibians and reptiles live in this river. 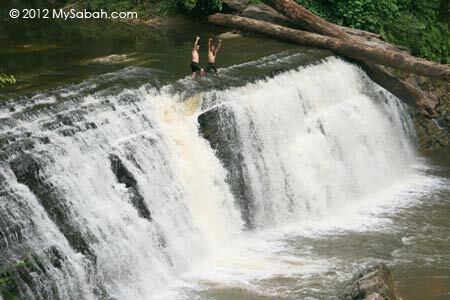 Imbak Waterfall is about 80 Meters in wide and 8 Meters in height. The photo above will give you an idea of its scale. It’s very slippery on top. My friend saw a Sambar Deer (largest deer of Sabah) there. Look closely and you will see hundreds of cascading “miniature waterfalls” on the sandstone or mudstone layers of Imbak Waterfall, a very interesting feature. Yes, I took a bath at the waterfall. The water is so cooling and refreshing. I didn’t use soap b’coz I don’t want to pollute the river. Can you spot the man on the waterfall? 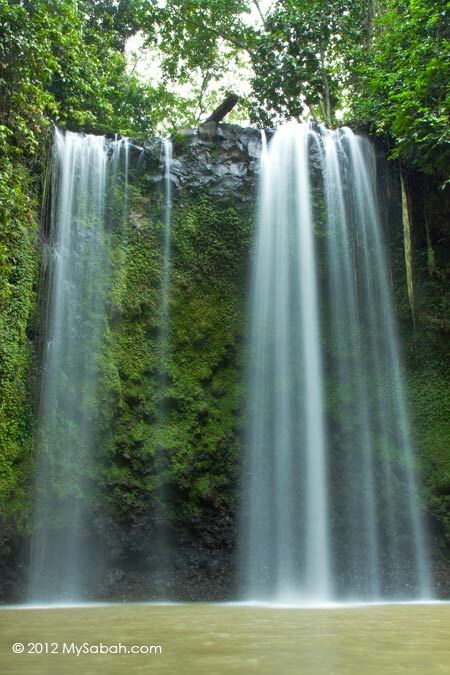 Besides Imbak Waterfall, there are other waterfalls such as Kuli Falls, Majau Falls and Pandan Falls in the canyon. Imbak Canyon is a mountainous region so there are many waterfalls to be discovered. Imbak Waterall is the most popular attraction of Imbak Canyon, but the real gem is the virgin forest there. In short, Imbak Canyon consists of two main vegetation, i.e., Lowland Dipterocarp Rainforest in the valley (Dipterocarp is the most important tree family of Borneo) and Montane Heath Forest (a.k.a. Kerangas, abundant with native orchids and endemic pitcher plants) on the ridges of higher altitude. Over 70% of the forest is unexplored. Pic: a tree with huge buttress in BBC Camp. The ranger told me there is a tree with buttress that looks like crocodile in Kuli Camp. There are a few forest trails in the canyon, ranging from 1 KM to 17 KM in distance, for those who want to do jungle trekking. Even though I stayed in Imbak Canyon for a day, I have seen or heard Serpent eagle, Helmeted hornbill and Gibbon. 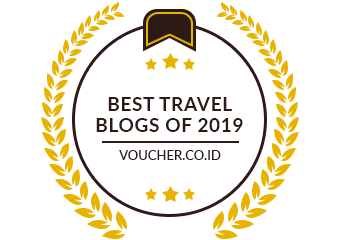 Many wildlife such as pygmy elephant, sambar deer, leopard, sun bear, mouse deer, orangutan, proboscis monkey and Sumatran rhinoceros also live here. Pic: a dead tree with big hole that can house 3 to 4 people inside. 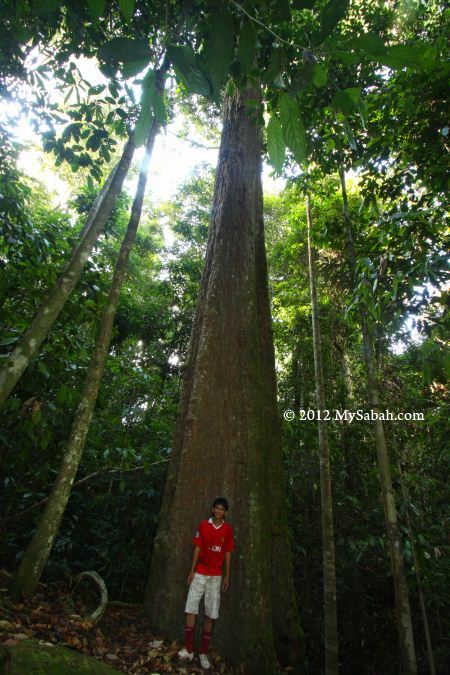 Tall trees such as Kapur and Keruing are common in the canyon, and Kapur Merah is the “iconic” tree of Imbak. To scientists, this virgin forest is a “botanical gene bank” where we can source for the seeds of rare and endangered plant species, which are considered high in pharmaceutical and biotechnological potential. Like other primary rainforest, you can see a lot of fungus, mushroom and termite nest along the nature trails. They play an important ecological role in decomposing rotten dead wood/leaf, to recycle the organic nutrients. Pic: a huge Ironwood (Belian) tree which is about 800 to 900 years old. For birders, you will be pleased to know that over 200 bird species are found in Imbak. 5 of them are endemic to Borneo, namely, Borneon Bristlehead, Blue-headed Pitta, Black-throated Wren-Babbler, Borneon Blue Flycatcher and White-browed Shama. Night walk here is fun as you may find vine snake and scorpion. But be careful of the hornet that is attracted by your torchlight, I was stung twice. It’s so painful that I thought it was snake bite. 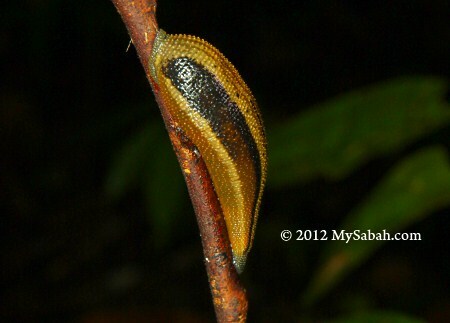 Pic: a fully-fed Tiger Leech resting on a twig. It’s so fat and full that it ignored me. Many are afraid of this blood sucker. 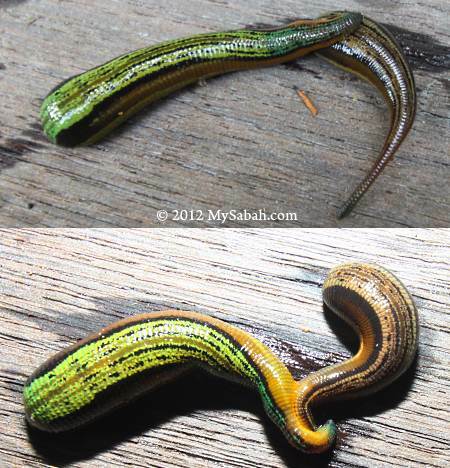 Anyway, tiger leech is not a tiger, and its bite is not harmful, so no need to get panic if you see one on your skin. The presence of leech means the forest is healthy and full of wildlife (food source). 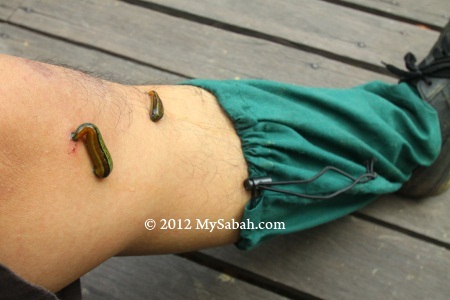 Pic: the leeches bypass my anti-leech socks and feast on my leg. After the leeches are full and drop off my skin, they start to get horny and mate. I’m proud to say that my blood donation contributes to the birth of more baby leeches, haha.. Visitors can overnight in Tampoi Base Camp, which provides basic accommodation and facilities. A 3-day-2-night or longer stay is recommended. They also have camping ground for big student or researcher group. Though no mobile phone coverage, they have Wifi and public phone (i-Talk) in camp. For me, that’s really impressive for a campsite deep in the jungle. You would see orangutan wandering around the camp in early morning. 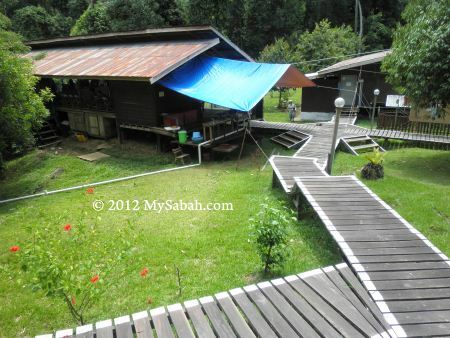 Pic: accommodation of Tampoi Camp. It’s divided into male and female sections. 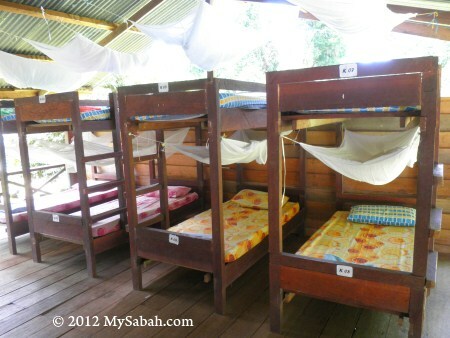 Pic: bunk beds with mosquito net. It can be chilling at night, so it’s advisable to bring your sleeping bag for extra warmth. However, the night was warm during my stay. The electricity is cut off between 12am to 3am daily. You can check out my photo album, to know more about what to expect in the trip. 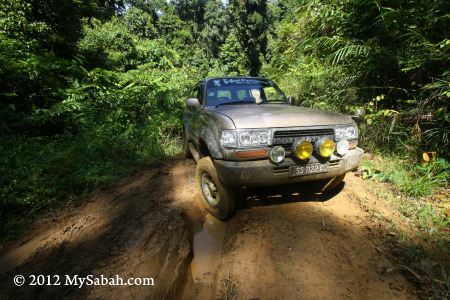 If you decide to visit Imbak Canyon Conservation Area (ICCA), you can book the tour with North Borneo Safari, the tour operator who is experienced in adventure tour and provides everything from 4WD transport, tour guide and meals in the tour.